The UK supermarket, Sainsbury’s, is rather red-faced at the moment. For the past 24 hours it has been unable to operate it’s online store, costing it around £1m in lost revenue. That’s bad enough, but the company has also had to face several media stories about its failure, such as this in the Daily Telegraph or this at the BBC. No doubt Sainsbury’s will get its act together soon. In the grand scheme of things online sales only represent a small amount of income for the company; they have never achieved the giddy heights of superstore rival, Tesco. Even so, Sainsbury’s will ride the storm of its Internet problem. The company’s future is not threatened by the failure of its web site. However, it does raise the issue of whether most businesses could survive some kind of Internet catastrophe. What would Google do if it’s servers all failed and we were unable to use their services? How would Facebook cope? What would all those home-based Internet entrepreneurs do? Many businesses have put all their eggs in the Internet basket – and that could spell financial disaster for them. For Sainsbury’s, the Internet is only part of their supply mix, which means they can cope. But for Google, or for those millionaire entrepreneurs, any Internet problem would be a disaster. And that situation may not be that far off. Already some senior people, such as engineers within phone giant AT&T, are suggesting potential “gridlock” for the Internet. We have already seen millions of Internet users affected by complete collapses – and that has had a knock-on effect for local businesses. What would your business do if the Internet went on a go-slow or if it ground to a complete halt? What would you do if rationing came in to force as the only means of controlling the traffic flow? Would your business survive? You can’t avoid having a plan in place for the potential disaster of not having a web site, or the Internet collapsing. If you have a plan, your business will survive. To shut your eyes to this kind of planning means there is a real chance your business will collapse. 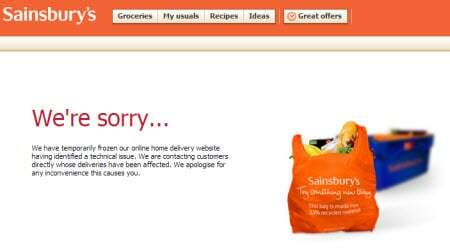 Sainsbury’s will obviously survive their “technical glitch”, but would a company whose entire business depends on the Internet? Make sure yours doesn’t.